Can't get enough of the browns! WOW! Great colors on this brown! Love the spots on this one! John with a beautiful 8.5 brown. 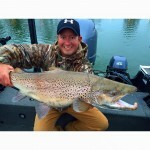 This 29 inch hen was just a few ounces from 10 LB. Close but no cigar! My 9th brown over 10 LBS. I'd rather be lucky than good! This beauty was right at 9.5 LB. and released right after this photo. A beast of a brown....Eric knows how and where to bang them! 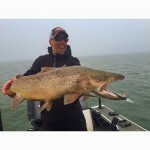 Milwaukee Harbor produces some monster browns! 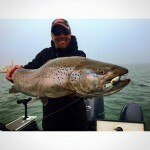 Eric H. with a killer brown from Lake Michigan. WOW! He has a mouthful!